I'm enjoying following this thread. The scene is really looking nice! It seems to me that knowing the perfectionist that you are, I think you would probably go the 220 routes and have peace of mind down the road rather than those "I shoulda's." I think Bill's idea of two different runs of hoppers is a good one, but since you scratch build a lot, I'm sure you'll find a home for those 202 trucks one way or another. nice video. I like how you get spillage and how some of the coal gets left behind. That's cool. I did decide to go with the 220 trucks for the next ten cars and placed the order with SJCC. I contacted my Mann's Creek experts, these guys wrote the book on the MC (literally) and they told me that after the logging operations were shut down on the MC they had lots of older trucks of different designs that they used for hopper cars. I will keep the cars I have built with the 202 trucks and all future cars will have 220 trucks and I will number them a much higher number, and I am going to go back and renumber the cars with the 202 trucks so they are more spread out, like these are the cars that are left from a larger group. 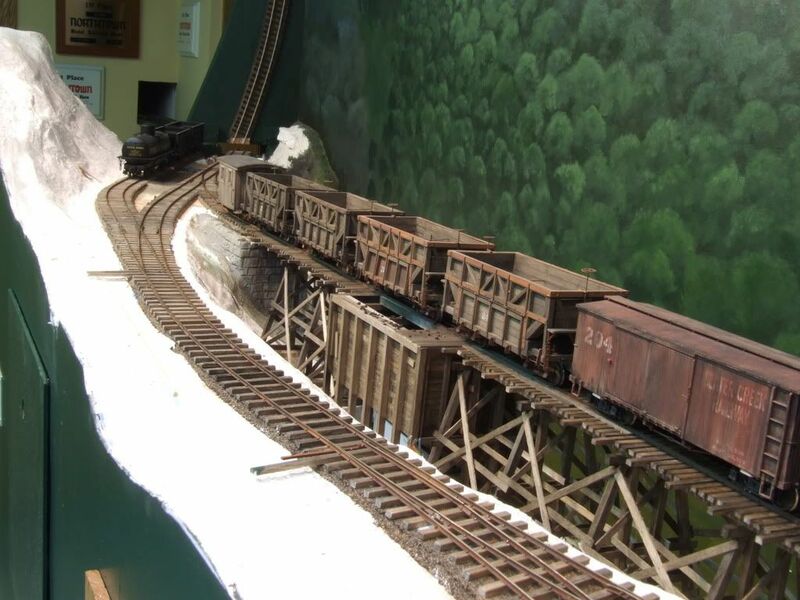 I should have a very productive week later this week because the family is going on a trip without me and I am going to take those days off and bury myself in the layout room with one goal in mine...to run a train out on the dump trestle under its own power and dump coal! So tune in Sunday to see if I can "get-er done"
I am looking forward to seing the coal train in operation. I have been lurking and picked up the Manns Creek book so I could learn more. The 220's look like a close fit to the Mann's Creek. The others look like D&RG trucks....I know they both are... The 220's also look great under ET&WNC hoppers. The big news is we are dumping coal! In 2009 I had the idea to try and make O scale narrow gauge hoppers that would actually dump a live load of coal by opening the doors, almost 3 years later I get to see that it really would work. I pretty much locked myself in the train room for two days with the goal that hopper cars will dump coal. My goal was to remove the DCC decoders and set up my other system but it took me a lot longer to get the trestle rail laid and finish a few other details. I also got side tracked and painted the fascia and did some more plaster work, so for now I am still just dumping the decoder cars. My next goal will be to get the cars converted do use the contacts. I still have lots of fine tuning to do on the trestle. I placed some of the surface planks on the trestle to see how far out I can plank without getting too much coal on the surface, it turns out I have too many and I will need to remove some. I am not sure what the real trestle looked inside the dump shed but I may build up some boards to deflect the coal down into the bin. I added the second set of contacts and I lowered them so they just rub on the bottom of the contacts on the hopper cars. The contacts on the trestle are distracting to me to look at but I hope that once I blacken them and build the shed over the top of the bin they won't be seen. The DCC cars work well but I want to reduce the drag from them and it was a little bit of a pain to program their address and use the throttle to dump them and it will be nice to just spot a hopper on the trestle and push a button. For the test I am using real coal, and although I was pretty convinced that I was going to switch to the ground rubber I may stick with the real coal. The real coal flows much better from the hoppers and there is not as much dust as I thought when the hoppers are unloaded. I tested a car shaker by mounting a motor to the side of the bin. The shaker motor had a flywheel with a piece of lead taped to one side of the flywheel to get it to vibrate. The shake did not work very well, it made more noise than it loosened the coal. I ran the motor at 3V to keep the vibration noise low but it really didn't do much. I touched the shaker motor to the car and the coal flowed really well. Most of the coal comes out of the cars fine and I would not really need a car shaker but I did notice that every now and then a few pieces of coal would wedge together just right and get stuck between the hopper floor and the door causing the doors to not close, so I would like to get a shaker that can be used to make sure the doors are not stuck open. I may have to install some kind of car shaker that can be lowered on top the hopper, which would not be prototypical, but that is ok with me. Lowering the car shaker would be just another step in the operation that would help add some time to the operation. here is the video link of a train pulling out on the trestle and unloading coal. 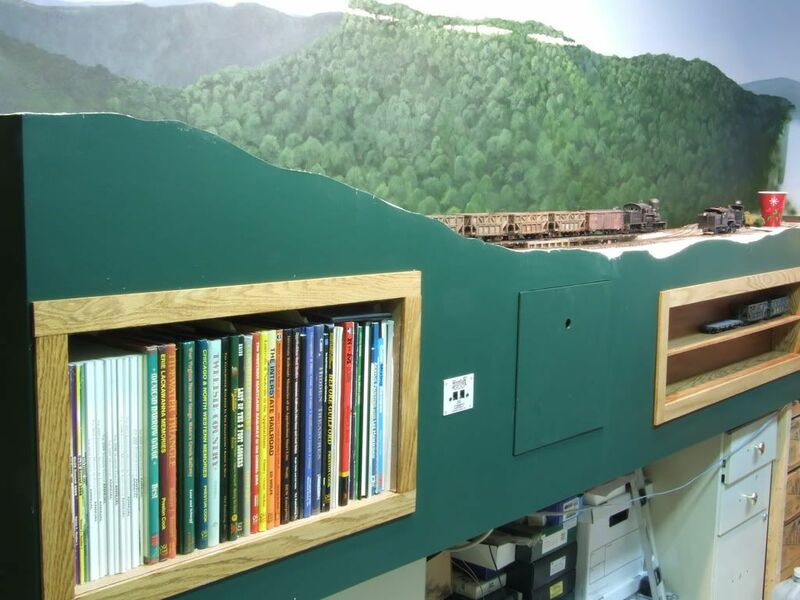 Here is a photo of the fascia painted and the shelf installed and the book shelf trimmed. The door to the DCC system still needs some work. Here is how the reverse scenery is working out, so far I like the look of it. 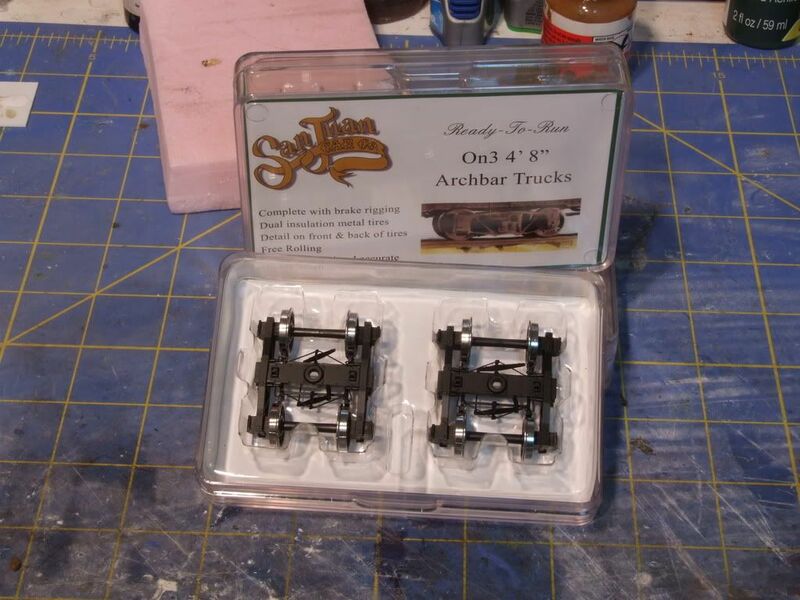 I also received my SJCC trucks, wow, they look nice, the packaging is amazing, although I am sure I am paying for it. The cool thing about the trucks is every one of them is in perfect gauge. I also had some people ask about my lift bridge and how I made it. My bridge is 3/4" plywood and it is hinged on one end with brass hinges. The brass hinges allow me to solder the track buss wire to them to power the bridge rails. The ends of the bridge and the approach tracks have rails soldered to PC boards to keep them in perfect alignment. The PC boards are glued to basswood which is glued to the sub roadbed and not the cork. 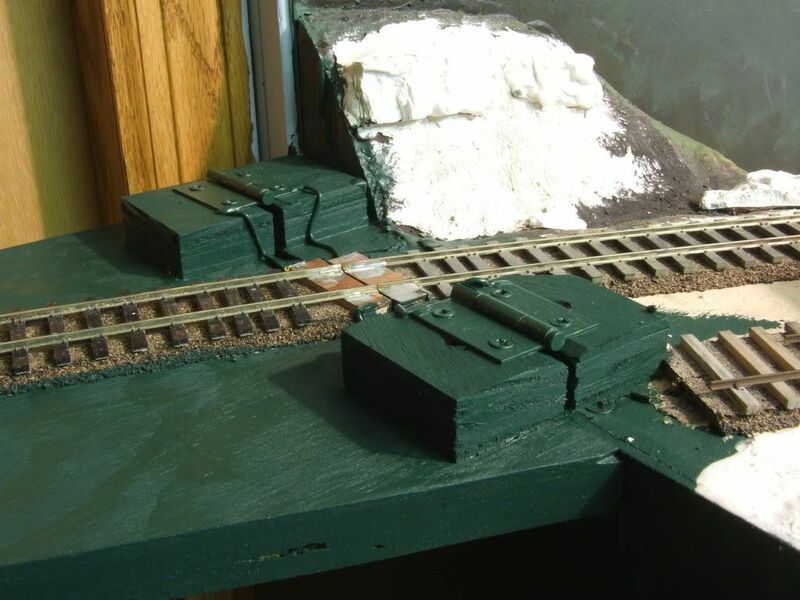 The end opposite the hinge is just a shelf with two brass pins that make contact to power the track on the other side of the bridge, when the bridge is up the approach track is dead. The hinges are mounted up on a couple 3/4" plywood blocks, having the hinges mounted on the blocks cause the bridge to swing up and away so the rails do not hit with the bridge is lifted. I mounted a piece of steel plate (old Athearn car weight) to the surface of the lift bridge on the non-hinge end and I use a cabinet door magnet to hold the bridge up so it won't fall when raised. Here are the hinges on the bridge, sorry, I forgot to take the photo until after they were painted green. Jeff, congratulations on achieving your goal. Neat video, BTW. Great work on the dumping hopper cars. All that work has paid off. cool video, great work, ive always loved your mann's creek cars. That is very cool, Jeff! Fantastic work, Jeff.... a difficult job well done! In the video, it looks like you are having too much fun with this hobby.........Awesome. Your layout really, really looks like the Mann's Creek. Great work. The scene is captivating to look at ... it is unusual, prototypical, and skillfully done. Watching the video, I think you need a push button on the fascia for "creaking timber" sounds as the train tip toes out onto the trestle. Bravo! You knocked it outta the park.